So no surprises… obstacle course competitions love a bit of swing. 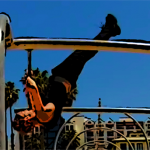 On the Ninja Warrior shows, it always makes for good television because it adds so much suspense… can the Ninja recover before their grip wears out? Will there be a spectacular splash or a last second save? 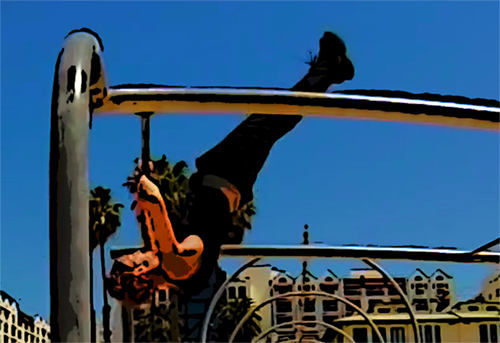 There are ways to correct the course of your swing though, and learning the techniques can totally transform a mad panicked whirling scramble into an efficient course-crushing run that any Parkour super-pro’d be proud of. These techniques are no guarantee though, luck totally plays a big part in our fun little adventure… that’s why no one person completely dominates American Ninja Warrior season after season. Not too many sports can claim that. Alright, enough of the old chat chit. Say you’ve launched through the air and caught onto something, be it ring, rope, bungee, ball, etc and you’re now swinging only sort of in the direction you want to go. You can still use that momentum, but you’ll need to adjust it to the direction you want by putting your feet together and pointing your two big toes on the forward swing. By pointing your big toes in the direction you want, this adjusts your hips, legs and waist to do what you need. If you were swinging 45 degrees toward the left for example, pointing your big toes towards the right at your exit lifts your left hip up to adjust your trajectory. You’ll need a couple more swings, but honestly it’s way better than flying at your landing point sideways or bouncing off a beam or something. So, in summary, swing with your hips, point the toes to the go. Say you’ve used all your luck on that miracle catch, but now you’re bouncing and swinging around in every direction. You’re forward, you’re backward, you’re all over the shop. At this point I personally think it’s best to completely dampen your momentum and start over. Point your legs and toes straight down until you stop swinging. If you’re facing the wrong way then you’ll need to do the technique I like to call Wild Crazy Legs of Ridic. Imagine you’re treading water in a pool and want to either face the other way or do some sweet 360s. You would swoosh the water around you with your hands in one direction to turn around. Okay, so imagine the same, but this time you’re holding a baby or watermelon above your head. It’s harder, but your feet would do the same direction swooshing your hands did before… just heaps more unco-er. So that movement of your legs, that’s what you need to do in the air when you’re all turned around. It looks crazy, but it seriously works. This is worth training on when you’ve got a single ball or ring strung up. Face one way then maneuver until you’re facing the other. I wouldn’t practice all week every week, but it’s a useful tool to know, and will help quell the panic when you’re swinging all the wrong ways. Okay, so finally you’re facing the right way, but you’re hanging dead. Now you want to do a small pull-up as you swing your feet up at a 45 degree angle in front of you. This generates a big swing real quickly. Point your big toes way above where you want to go. Don’t let go until the apex of your swing when your toes are pointed like, a metre plus above where you want to go, cos, y’know, gravity. If you’re flying to another hanging object, you want to fly way above it, put your hands on it to lower yourself… otherwise you’ll fall past it with your momentum and any grab you make will be super jarring. If you’re flying to a landing pad, you also want to fly way above it… so that your whole body lands fully on the pad. It does take some practice to get the pull-up and swing right, it took me ages actually, but it’s so hugely essential to flying through the air efficiently. I know it’s so many words, but here’s a little demonstrational insta. ← Countdown to the comp! 9 tips for Obstacle Course prep. → HIIT for Ninjas – A guide to prevent ‘gassing out’.